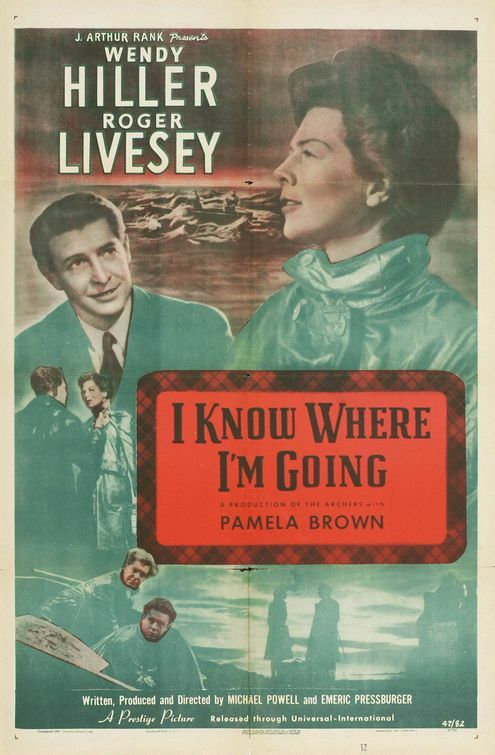 I Know Where I’m Going, which premiered in London on November 16, 1945, is a warm, romantic drama. The film stars Wendy Hiller as Joan Webster, a stubborn young woman who, according the narrator, “always knew where she was going.” After a montage that shows Joan’s growth from headstrong toddler to headstrong teenager to headstrong 25-year-old, we see her dressed in smart clothes, meeting her father (played by George Carney) at a nightclub, where she blithely informs him that she plans to travel to Kiloran island in Scotland to marry Sir Robert Bellinger, a wealthy, middle-aged industrialist whom she has never met. Her father is aghast, but, as always, Joan knows exactly where she’s going and what she’s doing. Handled differently, this setup could lead to a grim, Victorian melodrama, but I Know Where I’m Going is a playful film with touches of magical realism. On her trek to the Hebrides, Powell and Pressburger delight in each leg of her long journey (and there are many), and pepper the montage with fanciful touches, such as a map with hills made of tartan plaid, a dream sequence in which Joan’s father marries her to the chemical company owned by Bellinger (literally), and an old man’s top hat that becomes the whistling chimney of a steam engine. The joke implicit in the title becomes more and more clear as Joan and Torquil begin to fall for each other. The closer they become, the more determined she is to reach Kiloran. Eventually willing to risk life and limb to get there, it becomes clear that at least when it comes to love, she has no idea where she is going, and is too hard-headed to see anything clearly. Livesey, who was in his late thirties when this film was made, was originally told that he was too old and too heavy to play the role of the 33-year-old Torquil, but he very quickly slimmed down to get the part, and he cuts a dashing figure, although not a classically handsome one. Interestingly, Livesey never set foot in the Western Isles of Scotland, where most of the film’s exteriors were shot. 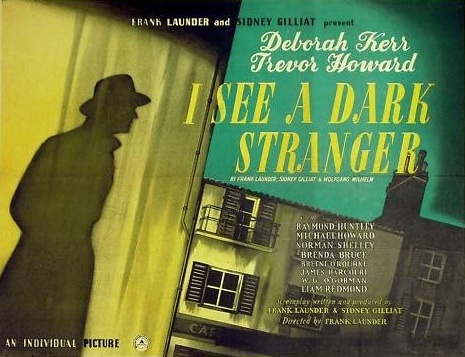 He was starring in a play in the West End during filming, so Powell and Pressburger made clever use of a body double for long shots, and filmed all of Livesey’s interior scenes at Denham Studios, in England. Besides its fine performances and its involving love story, I Know Where I’m Going is enjoyable to watch simply because Powell and Pressburger show such incredible attention to detail. The interiors may be shot on a soundstage, but it’s easy to forget that with effects that perfectly marry them to the location footage, such as rain lashing the windows, subtle lighting, and the shadows of tree branches moving back and forth on the walls of the houses and cottages on the island. There are no short cuts or cut corners in this film. Joan’s dreams don’t appear in a cloud of dry ice or in soft focus, they swirl kaleidoscopically around her head. And elements that might seem silly in another film, such as an ancient curse hanging over Torquil’s head, seem palpably real when they’re embodied by shadowy, decrepit, and glorious real-world locations like Moy Castle. Posted in 1945, November 1945 and tagged Alec Faversham, Allan Gray, Anthony Eustrel, British Cinema, Captain C.W.R. Knight, Catherine Lacey, Donald Strachan, Drama, Duncan McIntyre, Eagle-Lion Films, Emeric Pressburger, Erwin Hillier, Finlay Currie, General Film Distributors, George Busby, George Carney, Graham Moffatt, Herbert Lomas, I Know Where I'm Going!, Ian Sadler, Ivy Milton, Jean Cadell, John Laurie, John Rae, John Seabourne, Kitty Kirwan, Margot Fitzsimons, Michael Powell, Murdo Morrison, Nancy Price, Norman Shelley, Pamela Brown, Petula Clark, Roger Livesey, Romance, The Archers, The Rank Organisation, Universal Pictures, Valentine Dyall, Walter Hudd, Wendy Hiller. Bookmark the permalink.